Gingerbread pie with marshmallow meringue! Gingerbread just says "holidays." This custard pie has molasses and brown sugar and some of the classic spices for a spot-on gingerbread taste. The recipe itself comes from Sprinkle Bakes, but I make my "experimental" pies in miniature pie plates that are 5" across, so I have to adapt everything (starting with the crusts). 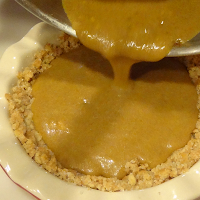 Preheat the oven to 325 degrees F. Mix the butter, molasses and brown sugar using a hand mixer. Mix in the flour, salt, and spices. Add the egg yolk and mix until thoroughly combined. 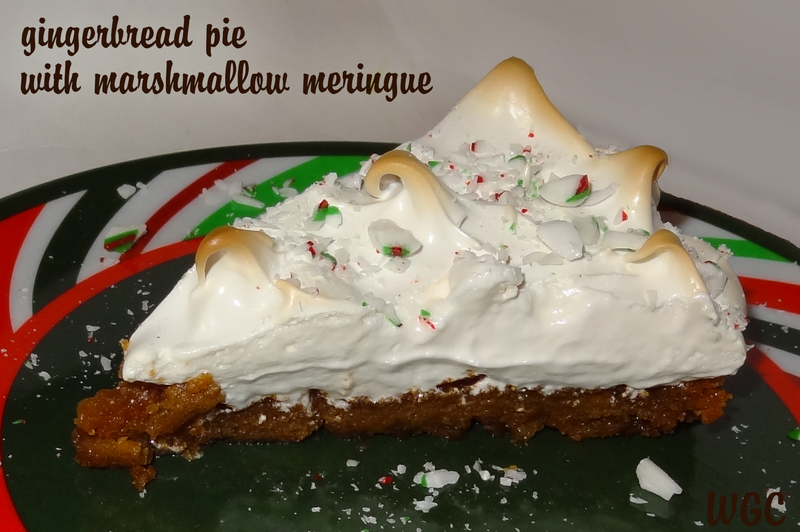 Mix in the vanilla and buttermilk, then pour into the pie shell [the original recipe uses a regular, unbaked pie shell; I used a blind baked graham cracker crust]. Bake for 30-35 minutes or until set (not jiggly in the middle when moved). I'd rate the pie itself "not bad." The texture is chewy, especially around the edges, but pretty good, though it's a little weird paired with the gingerbread flavor, which was pretty good. Add the marshmallow creme a little at a time. I recommend stopping the mixer and putting the marshmallow creme underneath the beaters. Otherwise, my mixer grabbed the chunk of marshmallow creme and flung it to the side of the bowl. Note that once you've added the marshmallow, the stiff peaks disappear and we get into a kind of ribbon stage again. That's perfect. 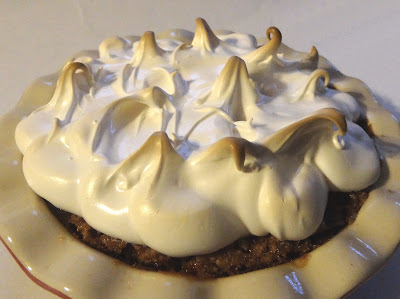 After spreading the meringue you can make it fancy. I usually spoon it on, making sure to seal the edges to minimize shrinking. 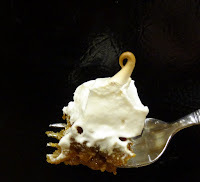 Then I use a knife or spatula to make the peaks, tapping it on the surface and pulling it off. Brown it in a 400 degree oven. 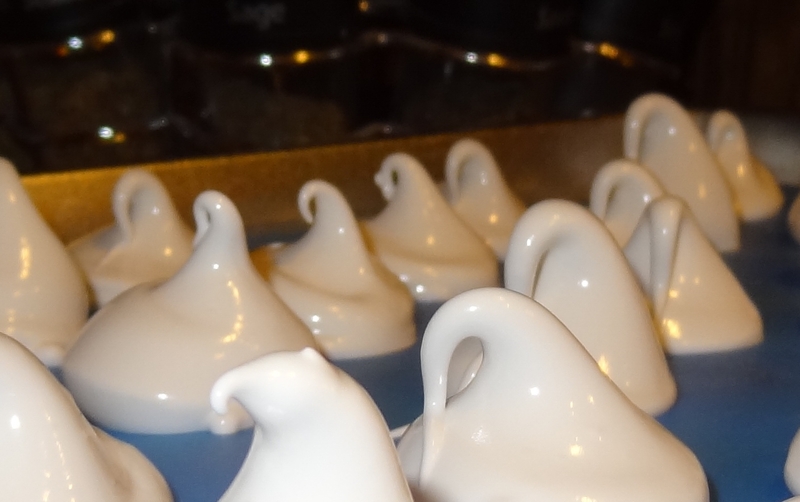 I love meringue drops and I was already hoping to make some for this year. The marshmallow flavor was a big bonus (and some mini chocolate chips would make these perfect!). Normally, meringue drops do NOT expand as they bake, but the marshmallow kind of changes that, so they expanded a little, and took a bit longer to bake. I gave mine about 30 minutes in a 300 degree oven. Once they look dry, you turn off the oven and leave them in there with the door shut (or slightly cracked, depending on what recipe you use). I know what you're asking: where are the glamorous shots of the final product? 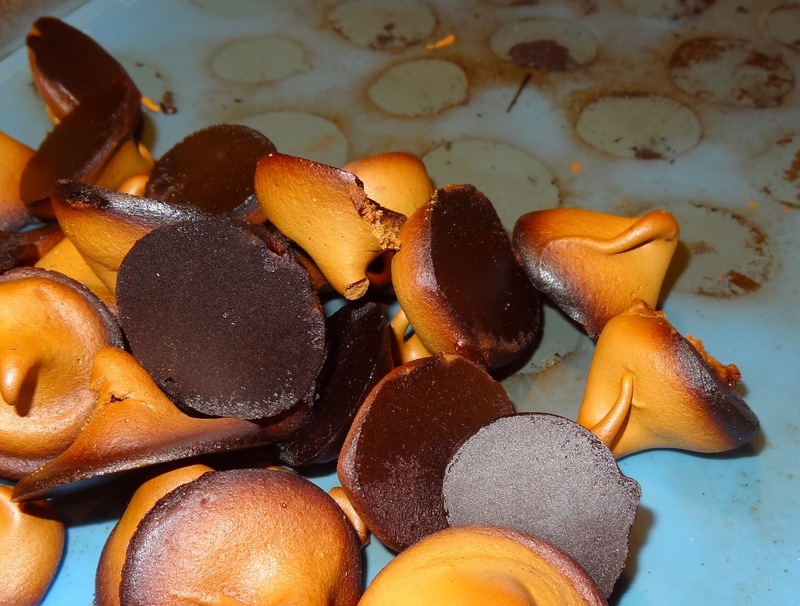 Well, when you're fixing dinner and your meringue drops are resting in one oven, and you need to cook your dinner in the other oven, make sure you turn on the right oven, or you'll ruin both. And that's what it means to be Wayward & Crafty. 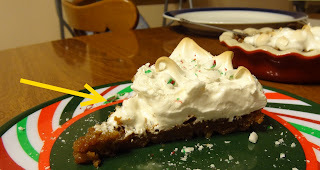 Fortunately, I still had the little bit on my pie. My then-one-year-old was fascinated by it and climbed up to the table to take a look. When she saw me coming to get her, she swiped a handful and stuffed it in her mouth. 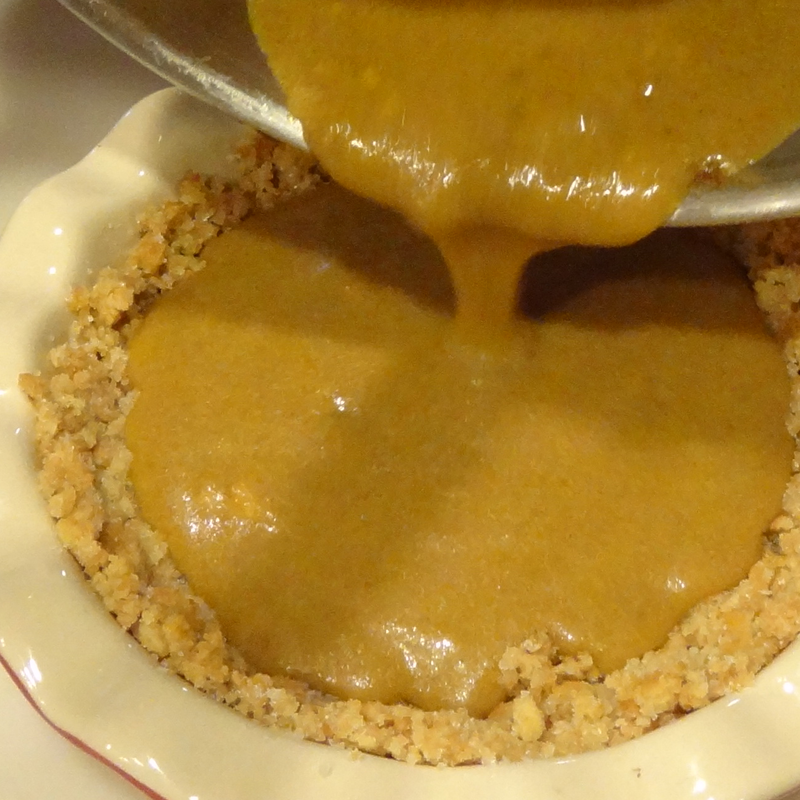 What pies will you be making for Christmas? How do you like to use (or eat!) gingerbread? Your then-one-year-old is sneaky! 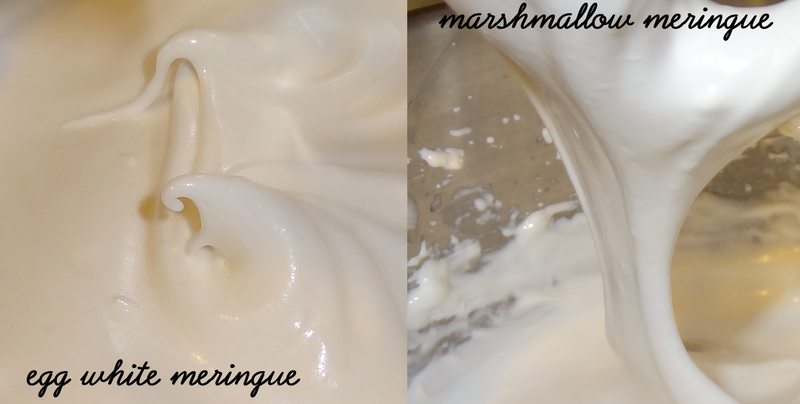 The marshmallow meringue looks amazing! Festive Garland Skirt and a Winner!